Kaimi was born and raised on the island of O‘ahu and graduated from Kamehameha Schools Kap?lama. 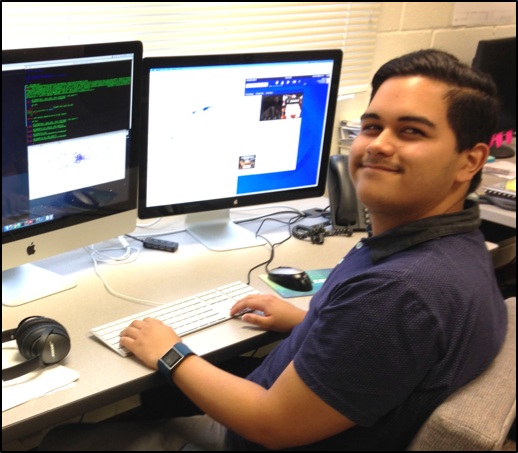 He is a freshman undergraduate at the University of Hawai‘i at M?noa, pursuing two BS degrees in Astrophysics and Mathematics. After attaining his BS degrees, Kaimi plans to pursue a doctorate degree within the field of cosmology. His goal is to further develop his understanding about how the universe works. The stellar content of the inner part of our galaxy, the Milky Way, remains ambiguous in the visible spectrum due to high extinction by dust and to the interference of a high concentration of gas and stars. However, studying the region in near-infrared light with high spatial-resolution imaging allows astronomers to detect and explore hundreds of new objects in this region. VISTA Variables in the Via Lactea (VVV) is a near-infrared survey of the galactic bulge and part of the disk which seeks to generate a high-resolution 3-dimensional—or 4-dimensional including time—map of the Milky Way. Further study of this region will advance astronomers’ understanding of the Milky Way’s evolution and develop a population census of the area. The goal of my project was to create a list of roughly 10 to 30 star clusters for further spectral analysis. I worked on three components that are fundamental to reach this goal: the creation of tools to automatically (1) locate clusters within VISTA images, (2) detect comparable regions for background star decontamination, and (3) characterize star clusters based on age, distance and reddening. Based on the software’s results and accuracy, select clusters will be added to an observation proposal for spectroscopic follow-up.